This product is a piece of 32 count Linen from Zweigart (Germany), Belfast range, colour "Platinum" (ref n°770). It is the very same linen used by the designer Tralala for many designs (see the list below). But its neutral shade is appropriate for many projects requiring a lovely "off-white" or "Light Sand" fabric. Despite the colour's name given by Zweigart, this is not a grey fabric. To help you pick the right shade, the second picture displays the different off-white and Sand shades available on our website, with from left to right: Ecru (off-white), Light Sand (Platinum), Dark Sand (Summer Kaki) and Warm Sand. This is a top quality soft linen, very pleasant to stitch, but you may need to work with a hoop if you usually use stiff linen or Aida. 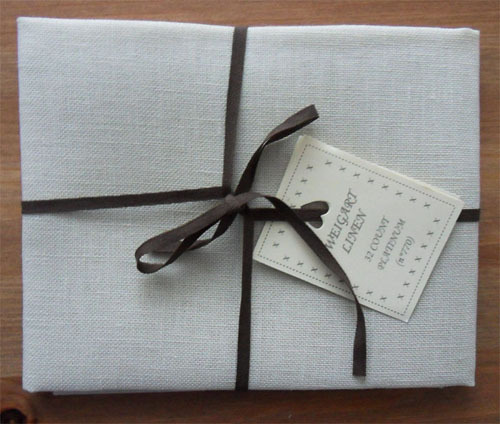 You can use this linen for the work of your choice.